Like most resorts in Walt Disney World, Port Orleans – Riverside comes fully stocked with a quick service dining option. The Riverside Mill has several stations for guest to mix and match meal items (such as a hot entree from the grill and an ice cream sundae from the dessert section) before checking out. Riverside Mill is spacious and has plenty of tables to choose from, which means the likelihood that the seating area would be full is minimal and there are seating options for everyone, including a large number of window tables. The day I picked the Mill for my lunch, I selected a sandwich meal for a taste test. From the Specialty Shop, I picked up the Roast Beef and Blue Cheese on Ciabatta. 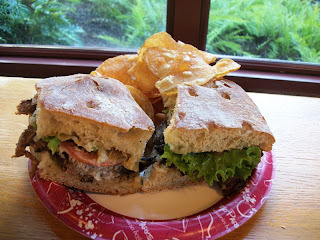 Ciabatta seems to be the new popular bread to use in sandwich shops everywhere, so I wasn’t surprised when it appeared in Walt Disney World. The intriguing part of the sandwich, for me at least, was the combination of blue cheese with roast beef. Generally, roast beef sandwiches I’ve eaten are paired with cheddar or a similar type of cheese. The unfamiliar combination of meat and cheese works extremely well, as the creamy, salty bite of the blue cheese mingles well with the juicy, savory slices of roast beef. Top it off with some sandwich staples, lettuce and tomato, and you have a sandwich that makes for a satisfying lunch option. As a side, the sandwich comes with either vegetable pasta salad or fresh chips. The chips are quickly becoming a staple throughout Walt Disney World’s parks and resorts. More of a kettle style spud than your typical crumbly bag of chips, the chips supply a hearty crunch and a bit more salt to the meal. The Roast Beef and Blue Cheese on Ciabatta shows all the signs of a well thought out sandwich, and not just a series of ingredients thrown together to get a dish out to the public. It is hearty enough for any appetite, and I wouldn’t be surprised, or opposed, to see spread to other quick service dining locations.